Concerns with Indoor Air Quality should never be ignored. Contact the air quality specialists from T. N. Bowes Heating & Air Conditioning, Inc. for accurate diagnosis, effective strategies, and sustainable results. Our trained technicians draw from years of experience, state-of-the-art technology, and a wide range of proven products. We are fully qualified to match your unique requirements with the ideal, whole-home solution. With quick and accurate installation, we ensure a clean, healthy indoor environment for your family. Exceeding your expectations for service and performance, T. N. Bowes Heating & Air Conditioning, Inc. is the right choice to protect your Indoor Air Quality in Southern Maryland and parts of Virginia. Enjoy cleaner air with our indoor air quality services! Air Purifier – Carrier’s award-winning air purifier works silently and in partnership with your HVAC system to trap up to 95% of pathogens down to .30 micron in size. To put this in perspective, the average human hair is approximately 100 microns wide. Featuring Captures and Kills technology and MERV 15 Efficiency, this patented air purifying system cleans indoor air up to 8 times per hour, traps pollen, animal dander, smoke, bacteria, and other pollutants, then uses an electrical charge to inactivate them. The Infinity air purifier has been proven effective against 13 pathogens plus a common household fungus. Fan-Powered Humidifier – Carrier’s fan-powered humidifier blows moisture vapor directly into your ducts, maintaining humidity levels within the ideal range throughout the home. A properly humidified home not only creates a healthier living environment and protects against damage to home furnishings, but enhances comfort and reduces energy costs. You’ll feel warmer at a lower temperature, allowing lower thermostat settings and reduced monthly utility bills. You’ll also combat issues with static electricity, dry skin, chapped lips, dry nasal passages, itchy eyes, sore throat, and increased vulnerability to illness. Energy Recovery Ventilator – Carrier’s Energy Recovery Ventilator is the equivalent of opening a window, with none of the drawbacks. As the ERV exchanges stale, polluted air from the home and introduces fresh, clean outside air, it effectively preconditions the incoming air to enhance energy efficiency. Featuring innovative, treated paper cores, the ERV also combats excess humidity, and prefiltered air for fewer indoor air pollutants. Cross flow configuration prevents mixing of contaminated outgoing and fresh incoming air. UV Lamps – Carrier germicidal UV Lamps are designed to minimize microbial buildup on the coil and drain pan of your cooling system, and prevent bacteria from becoming airborne. Eliminating the mold and bacteria that often thrives in the moist environment of your air conditioner not only protects air quality, but increases system performance as well. Accumulation of contaminants on cooling coils can diminish proper airflow by as much as 9%, impacting both cooling capacity and energy efficiency. Working silently, UV lamps keep energy costs low, comfort ideal, and make coil cleaning a thing of the past. Performance EZ Flex Cabinet Air Filter – The Carrier EZ Flex Cabinet Air Filter protects the condition and performance of heating and cooling equipment, optimizes airflow, and significantly improves indoor air quality. Feature a MERV 10 efficiency rating, the unit removes up to 65% of airborne particles as small as 1.0 micron, keeping your indoor environment cleaner and healthier. Replacing the filter is quick and simple, and high dust holding capacity extends time between filter changes. This effective air cleaner also safeguards heating and cooling equipment by not producing significant pressure drop. 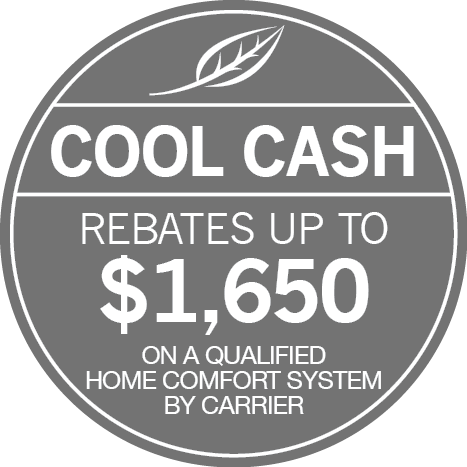 © 2019 T. N. Bowes Heating & Air Conditioning, Inc.